Have We Come Too Far With Digital Photography? What does it mean when an image that's technically a photograph is devoid of its photographic qualities? "Therein lies the root of this problem; in the effort to enhance, it’s far too easy to lose an image’s authenticity." 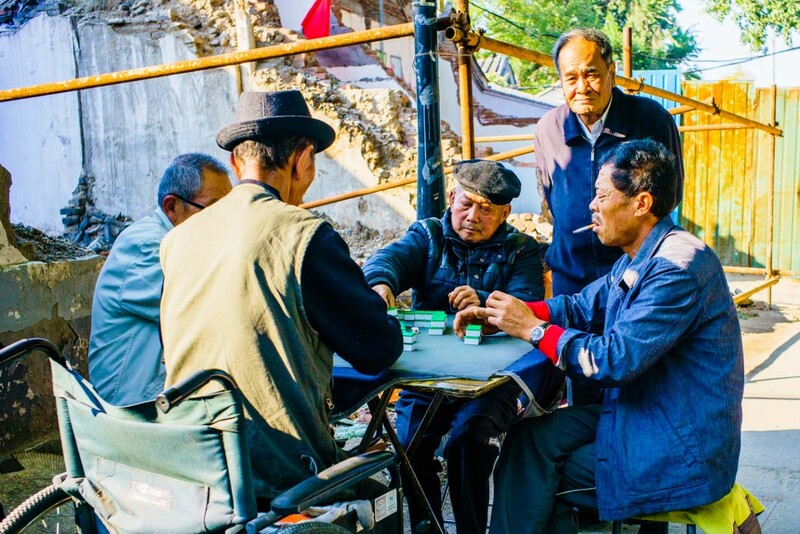 The image above is of some elderly men playing mahjong on a rare sunny afternoon in Beijing. But is it a photograph? Well, it technically qualifies as a photograph, as it was captured with a camera and lens. But through poor use of image processing software, it’s now devoid of nearly all its photographic qualities. To me it looks like a cartoon. But oversaturated, over-edited images like this are found all over the web today. Nowadays, I wouldn’t release an image like this. But getting to this point has been a long process of trial and error in Adobe Lightroom, where it’s way too easy to butcher otherwise decent photographs. Above is the original image, taken on a Sony A7R, a remarkable little camera that records very high resolution, high dynamic range files. The lens used was a Leica Summicron 35mm, an extremely sharp optic that I’ve found occasionally looks a little hyperreal on a camera with this much resolution. This image is problematic because it’s extremely high contrast — but by capturing at a low ISO and exposing for the highlights, for better or worse, every last little scrap of detail has been preserved. Beware the tools offered in your post-production photo editing software. Through a lot of trial and error in Lightroom, I’ve come to the conclusion that if you want to ruin otherwise decent photos, start with “White and Black Clipping” and “Presence.” Six out of seven of these tools adjust the image in a way that would be photochemically impossible or at least highly unconventional. It’s very tempting to use these global adjustments to make the sky a little less bright or people less silhouetted, but it doesn’t take much before the image loses its photographic qualities and takes on the heavily affected look of HDR. I now stay out of here completely. VSCO and Alien Skin sell Lightroom plugins that attempt to emulate a wide variety of film stocks. VSCO offers six different filter packs with hundreds of film stocks and processing options. It’s an overwhelming amount of choices and after spending way too much time experimenting with them, I’ve found not one looks anything like it’s supposed to. VSCO has provided some aesthetically pleasing examples on their site but I personally haven’t found value in any of these filters, and have spent a lot of time and money to arrive at this conclusion. Below is a small selection from VSCO 5’s Archetype Film Stocks. There are 189 filters in total. This one is supposed to look like a color reversal film, Fuji Velvia 50. Can this image even be called a photograph anymore? With access to every last little bit of picture information, there’s nothing stopping the photographer from bringing the highlights down, opening up the blacks and shadows, adding a little pop of color, and voila, Looney Tunes. Look familiar? A photo taken with iPhone HDR and Instagram filters has yielded many results like this. Without using VSCO or digging into unused dynamic range, an image that’s more photographically plausible can be achieved. The contrast is extreme enough that without digitally cheating, we’re not going to hold on to everything, so I’ve let the highlights go. If this were a professional shoot, a large silk or net would be used to control this contrast and bring the highlights down to a more acceptable level. Doing this digitally can’t emulate the interactive qualities of light, so it will never look as good as the real thing. The only thing saving this image is the high resolution of the A7R, as the problematic parts of the frame can be cropped out. Perhaps this version is even more compositionally and thematically interesting. Below is a raw capture of a “street doctor” in New Delhi, India, taken with a Sony A7R with a Leica Summicron 35mm. This photograph looks a little flat and lifeless. After processing the image for the first time, below is how I released it. I now realize what went wrong. After applying contrast, I felt the shadows were too deep and the highlights too bright. After opening things up and clamping things down, it still looked a little lifeless, so I added a touch of color, sharpness and warmth. In trying to alter the inherent qualities of this photograph, I unintentionally ruined it. Applying what I’ve learned the hard way, in the image below, I’ve taken out the digital sharpness, let things go dark and bright where they’re supposed to, desaturated a touch, left the color temperature balanced, and added a little texture. Is it now a good image? That’s not up to me to decide, but this treatment offends me far less than the previous example. In both my professional and personal work, every time I’ve felt like I finally wrapped my head around this, I’ve soon found myself back at square one. When there are infinite possibilities, accessing an image’s aesthetic potential can be an arduous process. For my own tastes at least, I’ve identified the qualities I aspire to and the pitfalls that prevent it. Moving forward, I’m striving to keep in mind the simplicity of photochemical photography and its qualities; the texture and softness of it, the faithful reproduction of tones and hues, and most importantly, accepting imperfections and resisting the urge to endlessly tweak. Therein lies the root of this problem; in the effort to enhance, it’s far too easy to lose an image’s authenticity. If you’re interested in learning more about the past and present of photography and film, please read on! In the past five years, there have been major advances in all aspects of digital image processing, particularly in HDR (High Dynamic Range), a relatively new photographic technique that reproduces a far greater range of darkness to brightness, a.k.a. luminosity. Various forms of this technology have found their way into the highest-end professional equipment, as well as low-cost consumer devices — like your iPhone contributing to a movement away from the photographic qualities of camera-based image making. An image’s visual characteristics are no longer determined solely by photographic parameters, but now as much by how scene data is captured, encoded and then interpreted by software. Though we’ve been on this trajectory for quite some time, in my opinion, it’s plausible that the evolving role of software in imaging could eventually push out traditional photography completely. I currently see very little difference in digital imaging for still photography and motion picture filmmaking. While the tool set varies from software to software, they all essentially do the same thing, and the skill of the operator is now as important as those in the field doing the image capture. Let’s go over the basic parameters of traditional photography: the choice of lens and its specific qualities, the use of in-front-of-the-lens or behind-the-lens filtration, the choice of film stock and its specific qualities, how it’s exposed to light in the scene, the technique of photochemical development, and then varying the amount of red, green, and blue light through the developed capture medium onto a final delivery medium. Along with this limited set of variables come fewer possible visual treatments for photographic images. There are also limits to how much picture information can be usefully captured onto emulsion, and how much it can be altered after the fact using only photochemical tools. These limitations actually provide the primary aesthetic distinction between what photography was and what photography has become. For now, because the memory of what film actually looks like is still fairly fresh, digital images that exhibit film-like qualities seem to resonate more positively than those without. In order to best compare traditional and contemporary photography, it’s useful to examine their aesthetic and physical qualities. Film images are composed of the specific grain characteristic of the emulsion, a mosaic of photo-reactive chemical particles like silver nitrate. Even low ISO stocks designed for sharpness are sharp without having a hard-edged, graphic quality. Separate layers of emulsion for red, green and blue light, each with a different photochemical reaction, never perfectly overlap, creating organic reproduction of forms. The pleasing softness and naturalism of these subtle imperfections has yet to be precisely emulated in digital. While it varies from stock to stock, hues and tones tend to be reproduced in a way closer to how we experience them with our own eyes. 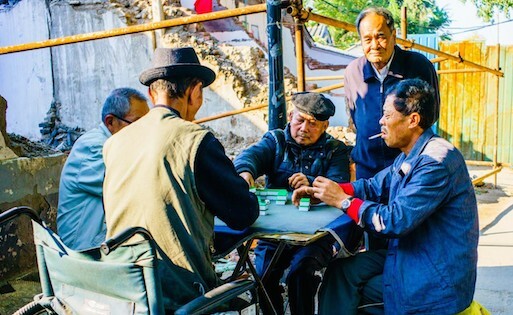 Though it’s a subjective and visceral reaction, a more human level of contrast and color saturation gives images a quality of truth and authenticity. Digital images are many times too pristine, too perfect, overly sharp and lacking texture. This inherent sharpness is something many photographers and cinematographers today struggle to overcome and conceal. In practice, HDR can be too much of a good thing. While having access to a scene’s full tonal range is helpful, particularly for composting and visual effects, in my opinion its heavy-handed use is the primary ruiner of otherwise good images. When excessively bright and dark values are digitally remapped closer to the middle of the tonal scale, it looks wrong because it’s antithetical to our own visual experience. Our eyes simply don’t see in HDR. When it’s bright, our iris closes to let in less light, causing our brains to perceive less detail in darkness. Predictably, the opposite occurs in the absence of light. Most research agrees we perceive more or less 10 stops of tonal range at once. Anything beyond this requires the eyes to adjust. Many of today’s digital cameras capture 12, 15, 18 stops, or even more by blending multiple exposures. HDR TV, the latest electronics industry gimic, on paper displays 17 to 20 stops, far more than what we see naturally. In demonstrations I saw in 2014, it looked hyper-real and weird, and is — in my opinion — another step in the wrong direction. Digital 3D fizzled, 4K TVs have undersold, so perhaps this latest innovation will entice consumers to buy yet another TV. Whenever I think of technology unintentionally butchering photography and filmmaking, “The Hobbit: An Unexpected Journey” comes to mind. This and the other two films in the Hobbit franchise were shot and released in HFR 3D (High Frame Rate). The near universal opinion on this new and experimental format was that it was a poor use of newly available digital stereoscopic technology. The intention of the filmmakers was to reduce strain on the eyes from the stereoscopic effect, and to create a viewing experience of heightened realism. It was a noble technical effort, but the effect was bizarre and routinely rejected by audiences. I would predict HDR TV and similar emerging viewing technology might suffer a similar fate. On a similar note, at various times in my career, I’ve attended online sessions for movies and TV shows where I’ve seen colorists basically re-light entire scenes. When digital images are perfectly exposed, today’s technology allows post-production artists to push and pull an image in any direction they choose. The fact that authorship can now so easily be taken away from its creators is problematic in and of itself. The results of this digital manipulation can be believable. But upon scrutiny, they have no photographic truth simply because they were captured with a completely different intention. It’s time to think about the photos and movies we’re releasing into the wild. They’re a far cry from what film was originally. Bennett Cain is former a New York City based camera technician now freelancing as a photographer and writer. On the front lines of the digital filmmaking revolution since the very beginning, his work on hit shows such as HBO’s Girls and Starz’ Power developed his critical eye for the finer points of digital imaging. His website negativespaces.com.